Jessica, a flea-bit grey Connemara pony, is up in her bridle; moving at a nice brisk trot. “she’s edged out to the center of the road again,” Susan Townsend is sitting next to me in the instructor’s seat of our small carriage. “She’ll test you a bit, you need to keep her more to the left.” The public road we’re driving on is just wide enough for one car but I move the pony more to the left. “Watch the ditch there, it’s hidden by weeds- not too close; whip at eleven o’clock please, you’re holding it too low.” Susan has me out on an evaluation drive, it’s my first day at Swingletree, I arrived only an hour ago and we already have a pony in harness driving down a quaint country lane in Norfolk, England. For nearly fifty years, since first meeting at a London carriage show in 1962, the team of Susan Townsend and John Parker have become synonymous with the sport and tradition of carriage driving in the United Kingdom. Their Swingletree farm is well known but John Parker’s reputation as a professional coachman is legendary. Driving his historic London Norwich Royal Mail Coach, horsed with four Hungarian Greys, he and Susan have logged tens of thousands of road miles together. Parker has driven for every imaginable event, in numerous films and countless competitions. In addition to all this activity, he serves as Director of the British Driving Society. The pony is having some air, Susan’s had me slow her to a walk for a bit to give her a rest. Looking out across a broad plowed field I spot the pair of Hungarian Greys on another road; they’re harnessed to a Bennington carriage. The Greys left the stables at the same time we did, carrying commercial driving students undergoing similar scrutiny but with John Parker as instructor. The Greys too are moving out nicely, their bright coats flash in the sun; their tall silhouette is traditional, very nineteenth century, very Swingletree. Back at the barn and Susan Townsend continues to observe my every move as I unhook Jessica from her cart. The mare is a bit fidgety. Susan reaches into her coat pocket, the glint of foil wrapping catches the pony’s eye as she pokes her nose out excitedly towards Susan. A roll of pressed mint Polo candies holds the mare’s attention while I finish unbuckling the traces. Meanwhile, John Parker has arrived with the commercial students driving the pair of Hungarian Greys, “How did you do?” He shouts. I shrug and look at Susan, who let’s me know I’m in need of work. I’m here to prepare for sections of the intermediate examinations on my way to earning a second level certificate from the British Driving Society. Day two begins with a pair of Connemaras. 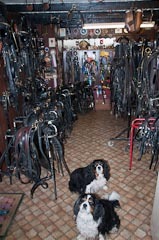 Carole Barber, a longtime member of John and Susan’s staff, helps me select the correct pair harness for the ponies. 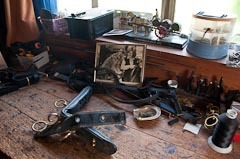 We’d spent the previous afternoon in Swingletree’s remarkable harness room, going over tiny details of what seemed like every known variety of traditional and modern harness. From working sets to the most formal of show pieces. What was truly impressive was the fact that all that beautiful harness; dozens of different sets, had been hand made by Susan Townsend herself. Today’s pair will be Jessica again joined by Lorna. Before we harness up though, it’s time for tea. Susan has brought out a large tray loaded down with steaming mugs. John Parker takes a mug from the tray and settles into one of his many entertaining stories from his younger days, this one is about some hijinks on the set of the film Dr Doolittle, a light rain begins outside the barn. Two King Charles Spaniel puppies wiggle around John Parker’s feet, the newest arrivals on the farm. Out on the road again, this time driving the pair and the wind has picked up with an approaching storm front. Fall is in the air and the summer weather is fading quickly. Leaves blow across the road, curbside garbage bags rustle and each new distraction is the boogyman for Lorna. “She’s really a very good pony,” Carole Barber explains, “We have her in the team when we do the Christmas show at Olympia. For that show these ponies drive through smoke and pyrotechnics”. Today however, Lorna has her own ideas about what is acceptable. Jessica is the steadfast worker of the pair, to support Lorna, we have her on the traffic side- on the right in this case. We round a corner and pick up the faint buzzing sound of a gas powered weed-whacker. Farther down the road we can see a workman clearing brush from the ditch, “keep your pace up,” Carole directs firmly, “be prepared and take up some rein.” as we approach the workman, the high pitched whine of the whacker grows louder, the man’s sweeping motion with the machine sends bits of vegetation spraying across the road in front of us. Lorna is growing more skittish, she’s winding up like a spring but I encourage her to move on by speaking to her. Jessica tightens up a little but is fine. Passing alongside the weed-whacker monster, Lorna suddenly launches forward, leaping up on her hind legs, Jessica jumps too but not as high. I grab a big handful of rein and manage to prevent the ponies from bolting. I keep the trot going, maintain a steady pace, relax my grip and the mares soon settle back down. We’ve survived the “pony eating monster” unscathed. Then Carole and I look up to see two towering Hungarian Greys on the road in front of us. John Parker and his students pulled up to wait for us; to see how we’d handle the situation. To my amazement, Parker smiles and gives us a thumbs-up as we pass by. 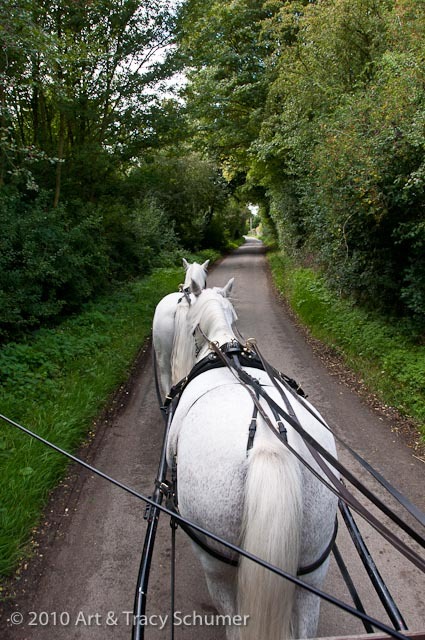 Real world road driving is very different from driving in the show ring; carriage drivers must have the skill to safely handle their horses at all times and under any circumstances; especially when turning around is not the practical option. This type of serious competence training and confidence building is what the staff at Swingletree excel at. It was in 1969 that John Parker received a call from Prince Philip, the Duke of Edinburgh. The Prince’s doctors had asked that he stop riding and his wife, Queen Elizabeth II, agreed with them. So it was Parker, who first taught Prince Phillip, a noted horse enthusiast, to drive a carriage. 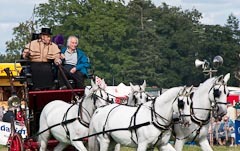 Prince Phillip then sought to combine the spirit of eventing with carriage driving and first conceived of driving a carriage like a three day event; today it’s known as the Combined Driving Event. John Parker was there alongside Prince Philip, in the early 1970’s, at the inception of Combined Driving. In those early events, Parker would compete in all phases with his four Hungarian Greys and an 1840’s vintage Demi-Mail Phaeton with turntable steering. 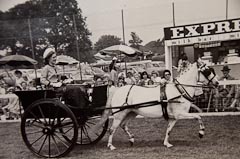 That carriage, along with an identical pony-sized reproduction he had built especially for Susan, is still part of Swingletree’s sizable collection. Top drivers from all disciplines and both sides of the Atlantic seek out John Parker; he is the instructor’s instructor. Day three; time for a tandem. Scottish driver, Ken Ruthven has arrived at Swingletree. 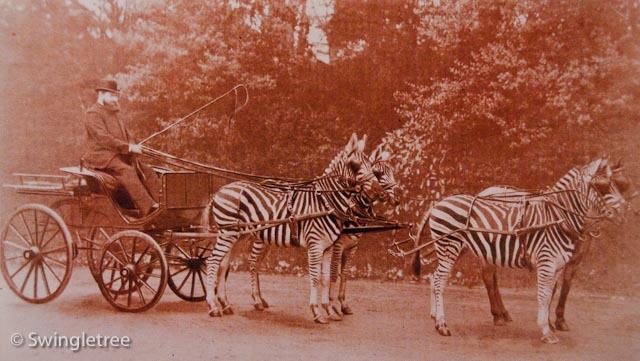 A professional coachman in his own right, Ken once worked in the Royal Mews at Buckingham Palace. A Mews is actually an old English term meaning a row of stables that typically included a carriage house and living quarters for staff. Ruthven has since coached several top competitive drivers, including U.S. combined driving competitor; Misdee Wrigley-Miller. He was here for additional professional certification. Ken’s been working through a lengthy program with Parker as his examiner. Today he’ll be evaluated on his ability as an instructor, teaching a lesson in tandem driving. Ken Ruthven is an expert with a tandem and is a member of the British Tandem club. I eagerly volunteered to be the student, although I’d actually never driven a tandem before. “Have you ever driven a team?” Ken asked hopefully, “I did training in the four-in-hand at Gloria Austin’s back in Florida,” Ken smiled, “You’ll do”. So once again, Carole and I headed off to the harness house to hunt up a set of tandem harness for the Connemaras. 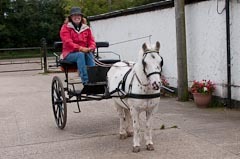 Back at the barn, Carole chose Jessica as our wheeler and for the leader, she and Susan decided on Lightning, a flashy pure white Connemara gelding with a temperament not unlike his name. 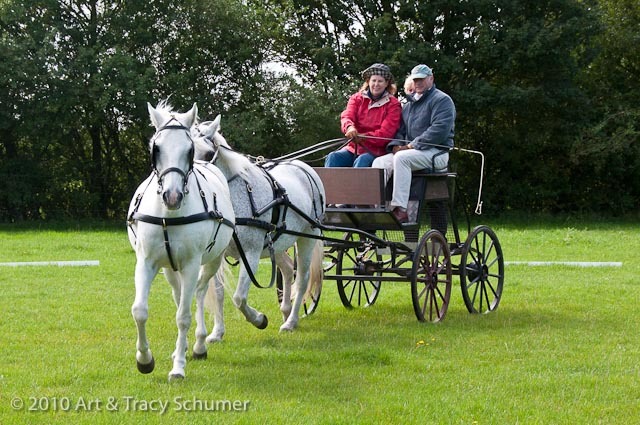 No road driving for me today, my tandem lesson would take place in the dressage arena. After a thorough orientation at the rein board with Ken Ruthven and with John Parker observing our every move, I harnessed up the tandem team and we put to. Just as if we were driving the four, Ken had me leave the leader reins unbuckled. The reason being if the lead horse ever broke free, a buckled leader rein, flying out from the driver’s hands, would stop short as it tried to pass through the roger rings on the bridle of the wheel horse. You’d lose the wheeler’s bridle; leaving the driver with no options ahead but a nasty wreck. 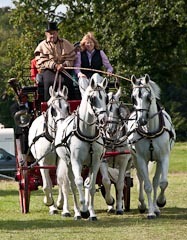 With a four-in-hand, the driver could lose the bridles of both his wheelers. 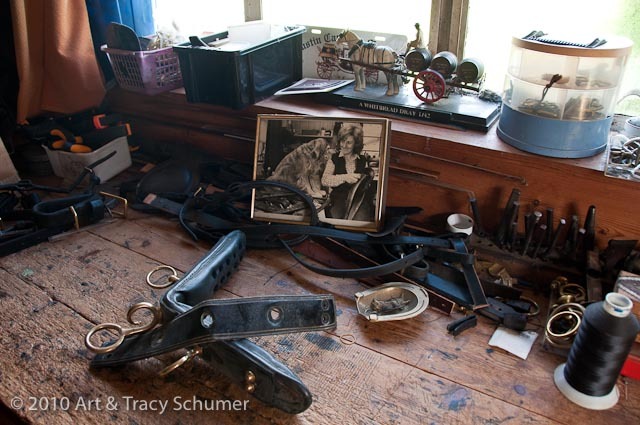 It’s often the smallest details that save lives in carriage driving. Ken Ruthven took the reins first, delicately maneuvering Jessica and Lightning out of the stable yard and down the short stretch of public roadway to the dressage arena. The ponies looked wonderful; a pair but not side by side. A tandem is driven with the horses inline; one directly in front of the other. 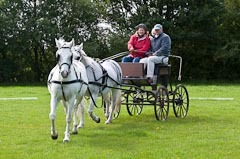 “This is the most dangerous configuration in carriage driving” Ken warned, “things can go pear-shaped quickly but it’s an elegant way to drive. Just as you would see the four-in-hand as really two pair; one in front of the other, the tandem is actually two single horses; one in front of the other.” The Random is also in this category of turnout, it uses three horses consecutively in a line and is a rare sight. The sun appeared, bringing with it blue sky and puffy white clouds. Swingletree’s dressage arena is surrounded by rolling green hills, forests and farm land. Ken Ruthven skillfully demonstrated the basics of tandem driving; Light hands! Move too fast, pull too hard and your leader can suddenly fold back into the front seat of your carriage. A few passes around the arena and it was time for me to drive. 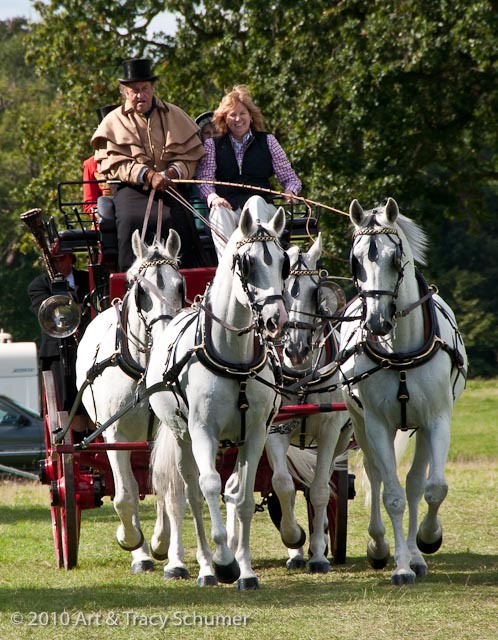 Unlike the four-in-hand, where the reins are all nicely spread apart as they fan out to the horses, the four reins of the tandem come strait back to the driver all together in one line. It can get tricky telling them apart. To help the student, Swingletree uses a dark set for the leader and a lighter colored set for the wheeler; small details once again. Lightening is an extremely sensitive horse, beautiful, temperamental and a little on the spooky side. Jessica was her normal wonderful self; my anchor. The weight of the leader rein itself, just slightly lifted, was all Lightening needed and he was off to the right or left with Jessica dutifully following suit and actually pulling the carriage. The lead horse in a tandem was traditionally a fancy riding horse on his way to a Fox Hunt. I, on the other hand, soon found myself on my way out of the arena! Too much pressure on the leader rein, too quick with my hands and there they went; right over the boards, out of the dressage arena and into the tall grass. Day four; pairs and practice. We’re back out on the road again with a pair of Connemaras. Susan Townsend is with me, peppering me with questions as we drive, “Why is it that the harness is black while the reins are always brown? What is different about this pair harness? Why are those extra rings on the ponies’ bridles? How would the rein configuration change if we were to drive this pair of wheelers as a Unicorn rather than a four horse team?” I’m scheduled to take several units of my level two exam tomorrow and Susan is working hard to prepare me as best she can. Another student might be put-off by her perceived “toughness” but carriage driving is serious business; Susan Townsend sleeps well at night knowing her students are competent. We returned to the barn and Susan continues to hit me with questions but the one I’m most interested in hearing is which pony will I get to use for my dressage test today? It’s funny but a lot of drivers have the idea that driving a pony is somehow beneath them. “It’s just not a real horse,” and that’s fine with me. I love ponies; they can move very fast when they want to. Ponies sharpen reaction time and can make a person a better driver. They’re smart and full of personality. For my dressage test I chose one of the smallest ponies Swingletree has in their stable; I chose William. William is a favorite at Swingletree and he’s loved by everyone including John Parker himself. He’s a Welsh cross of about twelve hands with a solid white coat that is covered in small black polka-dots. He was rescued from an abusive home by one of Parker’s grooms and has turned into quite the little goer in harness. William may be small but he’s not for beginners. When the press find themselves at Swingletree, they seem to always find William, he’s the little pony who’s become a big star around the barn. I gleefully harnessed up the little guy. Carole Barber joined me and at a quick pony-pace, we headed out of the gate and down the road. It’s actually a short distance from the front gate to the dressage arena but William is William; we had to stop for admirers. An elderly couple pulled their van off the road so they could get out and personally greet the cute wee fellow. They even kindly gave us an apple to feed him later. In the dressage test, William was wonderful. He moves out with power and if he was as big as the Hungarians, he’d be leading Parker’s team. Parker himself was watching too; sitting on his four-wheeler as he scrutinized our dressage test. The little pony didn’t let me down, he pulled us through like a champ. It’s important to note that although the horse may be small, that dressage arena is the same size as what a warmblood would compete in. It takes a lot of heart to cover that much ground at pace- my hat is off to William. Day five; a turn at the four-in-hand. John Parker is very particular about his Hungarian Grey coach horses; he’s even more particular about who he allows to drive them. 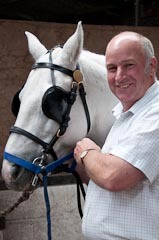 When he offered me a ride I was very excited, when I got the chance to drive the four big Greys, I was ecstatic. Thanks to my teams training with Gloria Austin, I was prepared to take on the challenge. My first assignment was to harness the two flashy leaders; Szamos and Washington. The Greys are huge, with each horse standing over seventeen hands or in excess of two meters at the withers. They’re true coach horses, bred to withstand the rigors of commercial travel in the days of the horse-drawn Royal Mail; a team for a working coachman but still fancy enough to horse a royal’s carriage. Even though these horses are quite friendly to handle, harnessing those big tall boys was quite a change from the darling Connemaras or precious wee William. Heavy coaching collars go on this time followed by stout harness. Then it’s into their big patent bridles with large formal Buxton bits; watch that big horse when he shakes his head- that bit will knock your teeth out! Washington is the youngest in this team at nine years of age and like a few of the other coach horses in John Parker’s stable, Washington was sent over from the Royal Mews at Buckingham Palace. He was supposed to be part of the team that horsed the dress carriages of Queen Elizabeth II but the handsome gelding couldn’t take the noise and commotion of the royal ceremonies; he was especially frightened of those tall black bear-skin hats the guards wear. It was nothing new for the crew at Swingletree, they’ve helped out the Royal Mews before. when the Royal Family needed an extra team of reliable grey coach horses for the wedding of Prince Charles and Lady Diana Spencer; it was John Parker’s team that horsed the bride’s coach. Out on the road with the four Greys and Parker makes it all look so simple. “They’re my children,” he says,“I know what’s going through there heads before they do.” Watching John Parker drive a team is like watching the conductor in front of a symphony orchestra. Lightness of the hands is his trademark. These beauties are over a half ton each in weight; it’s not strength of muscle that controls them, it’s the strong bond Parker has with them. 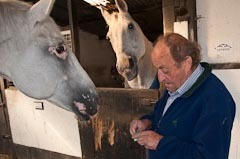 His care and sensitivity with his horses is demonstrated every time he leaves the stable yard. 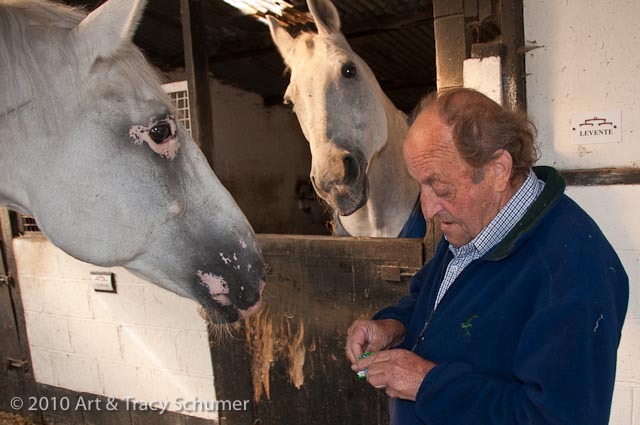 He’s been driving teams for 54 years, he’s owned, trained and driven hundreds of horses. In John Parker’s hands, a team of four becomes one. A few miles down the road and Parker pulls up. He guides the team to the side of the road and we switch positions. My heart is in my throat when he hands me the reins. “Now don’t start fiddling with those reins”, Parker scolds, “their perfect! I have them all set for you,” We’re driving in the English coaching tradition, with the reins or ribbons of the four horses held in one hand. I take my place on the box seat; four huge horses attached to thin leather reins in one hand, a seven foot holly whip with twenty feet of lash in the other. I glance out over what seams like acres of grey fur and give the command to move off. 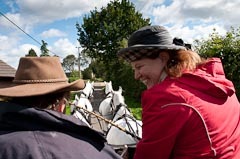 We’re just walking at first, our three grooms have dismounted the carriage and are walking beside the horses for safety. Then John Parker says, “You’re doing ok, go ahead and ask for the trot.” So I do and nothing; the Greys will have none of it, I try again, “Heads up boys- trot!” Still nothing, I might as well have been asking them to pour me a Scotch. Then Parker pipes up, “Trot on now,” and off they go. Driving a team is not about driving at all it’s about leading. The grooms quickly fall back and in seconds, they’ve all climbed back into the moving carriage; we’re underway and I have the reins. John Parker comes by his profession honestly. His grandfather and great uncles were head horsemen, stable managers and coachmen for the Rothschild family. As a young boy, Parker helped his grandfather and uncles, taking hunt horses out to the field for their waiting riders who were often miles away. Parker would lead two of the big hunters while riding one; he was barely ten years old. 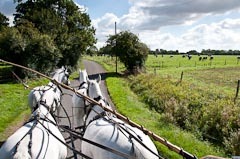 Down a country lane in the heart of England, four beautiful coach horses moving out briskly and I have the reins. It didn’t matter that our “coach” was only a Bennington carriage, it didn’t matter that we were all dressed in barn clothes. For the next couple of miles, I was Sylvia Brocklebank, I was a coachman, I was developing an amazing cramp in my hand! John Parker was pleased when I let him know my hand was giving out. It’s better to tell him up front, rather than try to keep up a brave face and then lose the horses. “You did fine love,” and that, coming from John Parker, was better than winning the silver plate any day. Driving Parker’s team that short distance gave me an acute perspective of what an incredible accomplishment it was for him to set the coaching time and distance record driving the London to Norwich mail route. The record had been originally set back in 1888 by the celebrated English coachman James Selby. The road coach Parker drives today, the one he’s owned since the early 1960’s is the same coach James Selby himself owned a century before. John Parker broke the record of his hero in June of 1996, driving his London Norwich Royal Mail Coach 139 miles, in 21.5 hours. He was nearly sixty years old at the time. Hanging on a wall in the lecture hall at Swingletree, amongst numerous fascinating mementos, are two awards from the Guinness Book of World Records. One is for Parker’s famous London to Norwich mail run and the other record is for the fastest change of a team of horses; a four horse team in full harness changed out from the coach and replaced with a fresh team. It took place at Olympia in London and this record, in fact, was achieved by John Parker’s grooms; young ladies who could show a NASCAR pit crew a thing or two about getting the job done and they did it in under twenty two seconds. The London to Norwich or “Great Mail Coach Run” as it’s officially known. required six teams of horses and thirteen team changes. Each team covered two legs with ample rest in between. The last team at the finish was made up of a mix of the most fit horses. At the finish line, Parker’s Greys were still so fresh they were tossing their heads and prancing for the press. In order for the record to be official, they carried a pouch of Royal Mail which had to be certified and delivered. It was just after midnight during the run that the coach pulled up to receive the official stamp from a waiting postal clerk. During team changes, a nurse would check Parker’s hands; messaging out cramps. At the end, the reins had to be pried free from the coachman’s grip. Day six; off to the fair. My level two tests went well Friday afternoon, it was tough taking the full British Driving Society exams but I felt a real sense of accomplishment when I made it through. The stable management section will be next and I’ll still need to submit my portfolio. With the really hard parts out of the way, however, it was time for some fun; we had a show to go to. Friday evening was spent getting the team and the big trucks or Lorries ready. The Swingletree crew busily getting the horses washed, groomed, wrapped and ready for travel. All the harness, uniforms and the Royal Mail Coach had to be cleaned, polished and loaded up. “He has to have his tea every hour when we’re on the road,” says Lisa, another groom. Nobody volunteers to share the first pot with Parker. Apparently this teapot makes a rather nasty cup the first time around. The Spaniels have decided that I make a nice dog bed and have camped out on my lap; I’m covered in doggie hair but couldn’t be happier. The English countryside is skipping past the window of the big rig, the sun is rising, we have four fantastic horses in back and it’s going to be a beautiful day. Arriving at the fair grounds is like a full-on military assault for the Swingletree team. They first stake out territory by getting the two rigs parked, then everyone launches; letting down the doors, setting up and unloading the 1.5 ton Royal Mail Coach with a power winch. If needed, this crew can have the coach, grooms and four horses ready to drive in under an hour. 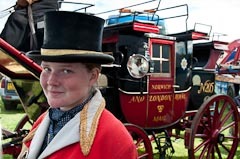 We’re at the “Henham Steam Rally” in Suffolk today, John Parker will be doing a Coaching presentation in the main arena. The Greys will stay in their compartments for now. When the time comes, they’ll be harnessed up inside the truck. It’s safer for the horses; no chance of one getting loose or a spectator getting stepped on. The grooms are amazingly adept at crawling in between tight spaces to get them ready. When the horses do come out, they’ll go straight into the coach. There are very few qualified professional Coachman left in the world. Many are alumni of the Royal Mews and learned the trade driving for the English Royal Family. There are a few more scattered across Europe but when I say a few, we’re speaking of only six or eight individuals. As a profession, driving a traditional road coach is a dying art. Few people have the resources to maintain a team, staff and keep up the vehicles. When they do, it’s rare to find a true coachman in charge of the operation. In the United States, for example, there’s Chris Higgins, Steve Holm and David Saunders. The UK has Ken Ruthven, George Bowman and John Parker. Amongst his peers, Parker is considered the best whip in the business. With curtain time approaching, everyone hops into action. 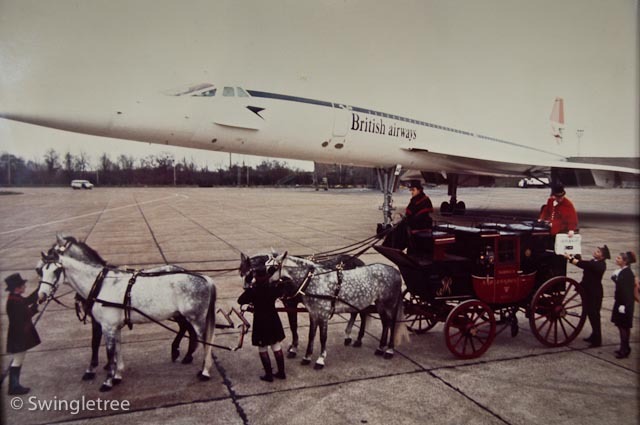 The harnessed horses are brought out from their compartments and put to the Royal Mail Coach. John Parker has donned his driving apron, coachman’s cape and black top hat. 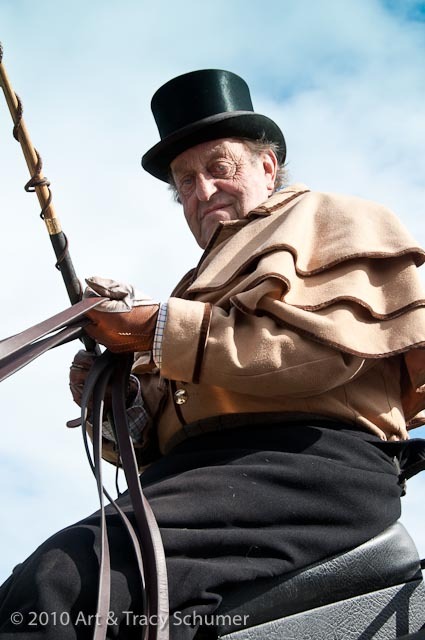 He takes his place on the box seat and watches carefully as the horses are hooked in. With his Greys harnessed and ready, Parker’s grooms have put on their smart black coats and top hats. Rosie, is the team’s official bugler and is dressed in red. 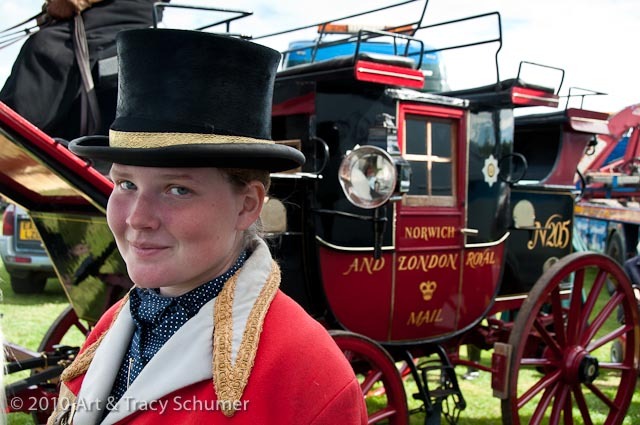 Historically, the only official postal employee on a Royal Mail coach was the guy in the red coat. His job was to write down everything that happened along the journey. He was also the armed guard who carried the official Royal Mail in a special pouch and sounded the bugle whenever the coach was coming into it’s next stop. “I do it because I love it,” says John Parker. At a spritely seventy one, he can still drive better than anyone, he’s a true master and he loves to teach. Out in the arena, Parker drives an impromptu, near perfect dressage test with his heavy road coach and four Greys; even performing the one handed circles. He’d previously swung past the announcer’s booth and picked up a ring steward holding a microphone without missing a beat. As he continues around the arena, he entertains the large crowd gathered with the history of his coach and of coaching itself. If Parker has anything to do with it, its a history that will live on for some time to come. Sylvia Bocklebank, Road Coach "Nimrod"
Comments for "Five Days at Swingletree"
Ken Ruthven on October 08, 2010 For your own interest, and just to clear something up, when the tails of the leader reins are buckled, the danger is that if the leader breaks free, he will pull the reins through your hand and the buckled end then catches your fingers and can pull you forward. This of course means that you lose control of the wheeler also. In extreme cases you can be pulled out of the seat and fall over the wheeler. Carole Barber on October 13, 2010 Welldone for mastering your rein control but the ponies have never shown any signs of bolting, they just have a little life in them which you need when you are teaching we are very aware of heath and safety at Swingletree and would never use any any not suitable for the job. Tracy on October 14, 2010 Carole is a top notch instructor and the pair we were driving are equally top notch. The point I feel Carole may have overlooked here is the fact that, as horsemen, we must be diligent at all times and prepared at all times for the unexpected. In my own experience, I have often lived that moment when the horse I was riding or driving reacted in a manner contrary to that horse’s character; it’s often the most “broke” horses that catch us off guard. I would like to take this opportunity to commend the staff of Swingletree once again. By allowing me to deal with the situation myself instead of taking over- Carole Barber helped me to advance my skill and become a better driver. Thank you also Carole, for taking such lovely photos for the article- they really do look terrific.